NEUSPEED Road Wheel - RS5 UNIVERSAL - Pann Auto Performance - San Diego largest aftermarket automotive performance parts - What do you drive? NEUSPEED has offered high quality, high performance parts and accessories for over 30 years. With that experience, NEUSPEED’s new Race Series Forged road wheels epitomize the look, fit, and performance enthusiasts have come to expect. Each and every Race Series wheel is manufactured to the highest tolerances – meeting strict JWL/VIA certification. Forged wheels are heated then compressed into shape under huge pressure in dies. This process heats but does not melt the material. This is what gives NEUSPEED RS Forged wheels more strength with less weight. Because the material is never melted into a full liquid state, there is no way for impurities or air bubbles to become incorporated into the material. This highly organized internal grain structure translates into increased strength for a given quantity of material. This manufacturing technology translates in advantages on the road. 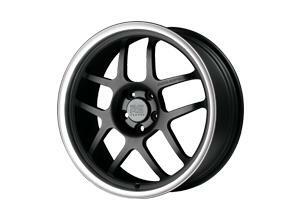 Fitting a set of NEUSPEED RS Forged wheels reduces un-sprung weight without compromising strength and durability. The weight factor is significant when considering the forces that affect handling. Less weight equals less inertia. Reduced polar movement of inertia decreases the energy required to spin, slow, or change direction of any rotating part. Use of light weight wheels equates to faster acceleration, more efficient braking and better handling. Sold individually, order quantity 4 for a complete set.